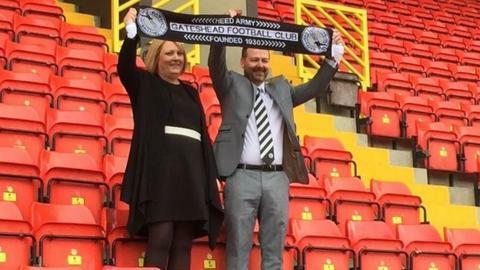 Owners Richard and Julie Bennett have declared their intention to sell up and end their involvement at Gateshead after three years in charge. The husband and wife duo took over from Graham Wood in May 2015, with the aim of returning the club to the Football League for the first time since 1960. However, promotion has eluded them, as did an FA Trophy final this season after Bromley beat them in the semis. "It has been a heart-wrenching decision," a statement by Richard said. "But having invested considerable time and money during the past three years, we feel that we have taken the club as far as we possibly can." After selling their chemical testing company based in County Durham, the Bennetts moved into the football business as relative novices, albeit with the initial help of former owner Wood. The couple, from Consett, are confident new owners will inherit a strong business with potential for improvement. "We are leaving the club debt-free and in a healthy position, which presents a fantastic opportunity for potential new owners or a consortium who share the same aspirations of securing a return to the Football League," the statement continued. "It has been a very enjoyable journey and we would like to take this opportunity to thank everyone for their loyal and dedicated support during an amazing three years. "It is our intention to seek new owners as soon as possible to ensure the club is in a position to sustain and compete at the highest level possible for next season."